I haven’t yet retaken the Cook Wise Raised Waffle Quiz. Truth is, I may never retake it. Because as much as I would like to tame that yeasty beasty, there are plenty of other recipes out there to fill my plate with waffle love. One of the first waffle recipes I ever tried had the audacity to call itself the Waffle of Insane Greatness. Humble much? The recipe came with the following disclaimer in the fine print, “this recipe was provided by professional chefs and has been scaled down from a bulk recipe provided by a restaurant. The Food Network Kitchens chefs have not tested this recipe, in the proportions indicated, and therefore, we cannot make any representations as to the results.” Hey Food Network, if you post a recipe on your website it’s pretty safe to assume that a majority of people will figure that you have tested the recipe and that you are endorsing the results. Since when do recipes come with fine print, disclaimers, and limits of liability? It’s not an insurance policy or lease agreement, it’s a waffle. The question is, is it truly a Waffle of Insane Greatness? You’ll have to judge for yourself. The fact that I currently have a double batch of these in the freezer should in no way influence your decision. BAH Fine Print: Who am I kidding? Of course I think you should try these waffles. I have tested this recipe, in the proportions indicated, and I do make representations as to the results. I represent that if you don’t think these are insanely good waffles, you should send them to my house. The Mistah and I will gladly accept them. BAH Note: The recipe posted at Food Network specifically said not to use any nonstick cooking spray on your waffle iron. 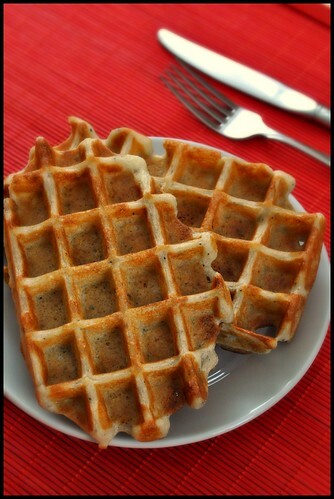 With 1/3 of a cup of vegetable oil, you don’t have to worry about these waffles sticking. Combine the flour, cornstarch, baking powder, baking soda, and salt in a medium bowl. In a separate bowl mix together the oil, milk or buttermilk, egg, sugar, and vanilla. Add the liquid mixture to the dry ingredients, mix well, and let sit for 30 minutes. Preheat your waffle. Cook the waffles according to your machine’s instructions and enjoy. Wendi, is there an ingredient in these waffles that makes them insanely great? Just curious as to what sets them apart from, say, a waffle of moderate greatness. I found a waffle recipe from 1621 that used “a piece the size of two eggs of freshly made cream cheese.” I’m not sure what the cream cheese added to the recipe, but I thought it was interesting that this made a good waffle hundreds of years ago. Hmmm, what makes these insanely great? You know how some waffles come out of the iron soft and flabby? I hate that. These are good and sturdy and can stand up to butter and syrup or jam. They also have a flavor that I can’t quite describe. It’s not quite a tang and it’s not malted but it’s not your everyday bland waffle flavor either. Seriously, after you eat one of these, you’ll never want another Eggo again. Am I the worst food blogger or what? I can’t even describe insanely great waffles. I need to start keeping better notes! Oh Wendi-pants, you so funny. 🙂 I love me some waffles but I’ve never made them. Could be lack of owning of waffle iron. Pancakes it is! Boo, lack of a waffle iron would present a significant challenge to making waffles. Our waffle iron was a gift and while we don’t use it a whole lot, you’d have to pry it out of my arms to make me give it up. Lazy weekend mornings eating homemade waffles (and BACON!) is one of my happy places. It must be the cornstrach that makes these insanely great…because that is a strange waffle ingredient! I’ve been thinking about sourdough waffles (must be that email from KAF yesterday offering free starter). Yumlish. Beth, funny you should mention the cornstarch. The universe had me on a waffle safari yesterday, looking at all kinds of different waffle recipes thanks to Orangette’s post. And I only saw one or two others that had cornstarch. If there’s a food scientist in the house, can you please educate me on the role the cornstarch plays in this recipe? I also finished reading Spoon Fed on Sunday, which brought me back to the Raised Yeast Waffle recipe that I failed at so miserably earlier this year. If 2009 was my cake quest, I think the Universe wants 2010 to be my year of the waffle. I ended up with about six different recipes to try out.